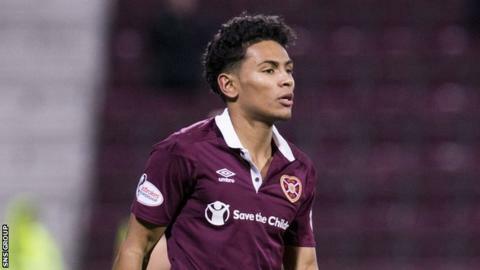 Manchester United full-back Demetri Mitchell says he has "unfinished business" at Hearts after returning on a season-long loan. The 21-year-old played 11 times for Craig Levein's side last season after arriving in January, scoring once, but missed two months through injury. "The fans were great, the manager was great with me and that's the reason I'm back," he told the club website. "It'll be good to get playing again. I kind of fell in love with the club." Mitchell, capped by England at Under-20 level, added: "I had a good spell here last season and I feel like I've got unfinished business because I got a little injury." Meanwhile, BBC Scotland has learned Hearts' summer signing Bobby Burns is moving to Premiership rivals Livingston on loan. The versatile 18-year-old has made four appearances for the Tynecastle side since moving from Glenavon.